I spend my whole weekend rearrange my room and clean. In the middle of it all my vacuum cleaner gave up on me. Oh boy! When everything was done, it’s time to enjoy my room and blog. 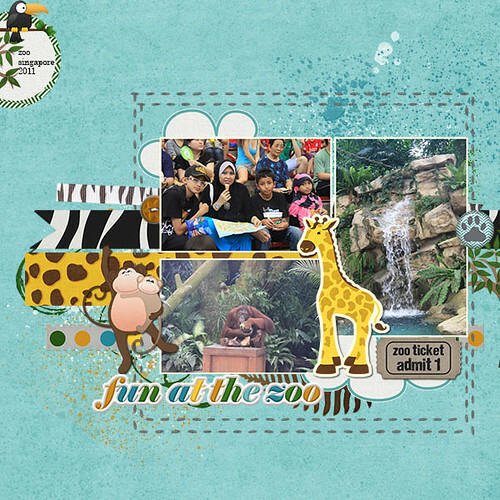 This weekend Pixelily Designs has a new kit called Safari Trip. It’s cute and fun and you can scrap your heart out with so many beautiful element to play with. When I saw this kit, it totally reminded me of my trip to Singapore zoo in 2011 that I haven’t had the chance to scrap. I was so excited to open up my album and make layout with the photos. Yeah!